We believe that the Pre-Kindergarten and Kindergarten years are among the most important in a child’s life. 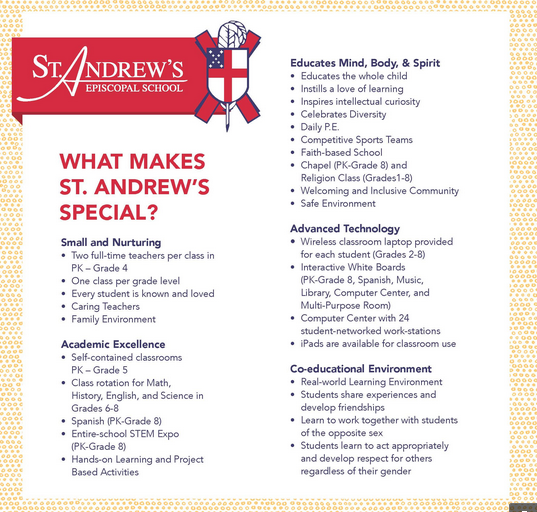 With our atmosphere of warmth and caring and our emphasis on making learning a happy experience, St. Andrew’s is a very special place for children to begin their educational journey. Our teachers help each child develop personal responsibility and positive self-esteem. Creative play, large and small group instruction, and individualization enable students to progress at their appropriate pace. A head teacher and an associate teacher lead each Pre-Kindergarten and Kindergarten class. A separate building, De La Vega Hall, offers bright, spacious classrooms, indoor play and paint rooms, and extra spaces for individual instruction. In Pre-Kindergarten, we emphasize language arts, math readiness, art, music, science, Spanish, and motor skill development. Kindergarten furthers these goals as students learn to read, write and use the computer. Specialized teachers in art, music, library, physical education, Chapel, and Spanish work with all children in the KinderCottage.